Someone at the Purim party at Rabbi Mordechai Machlis said that these Purim celebrations have been her best Purim celebrations ever. First I thought this sounds exaggerated but in the end, I do agree with her, as I can make the same claim. In the years before, I used to go to Chabad for the Megillah reading and this was basically it. 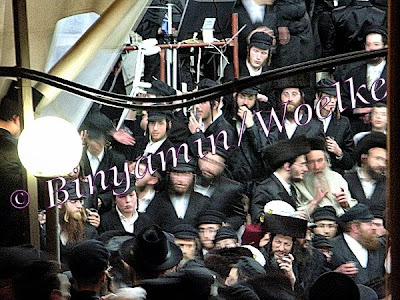 Compared to the Chassidim in Mea Shearim, Chabad doesn't know how to celebrate. At least not at the Tzemach Zedek Synagogue in the Jewish Quarter. This time, as mentioned before, I went with a friend to Mea Shearim for the first Megillah reading and we enjoyed it very much. I can only recommend the Great Breslov Synagogue in Mea Shearim Street. The people are nice and the Baal Koreh was incredible. Yesterday, on Purim Shushan in Jerusalem, we first went to the party at Rabbi Mordechai Machlises house. It was so packed that we thought we wouldn't fit in anymore. But we did. The food was, as usual, great. Thanks to Rebbitzen Henny Machlis and the kitchen team (the Machlis daughters). The guests were drunk but still behaving well. At about 7pm, I went with two friends of mine to Mea Shearim. One is mostly accompanying me anyway and the other one, has never been to a Tish but was so anxious to go. 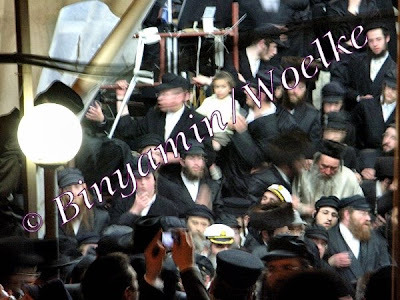 I think that many people from outside the haredi world didn't know that there are huge celebrations taking place in Mea Shearim last night. Starting in the late afternoon and finishing at about 10pm. The Toldot Aharon already started at 5pm and Avraham Yitzchak did at 6pm. Because no one seemed to know, we were the only visitors from outside. At least as far as I saw. No one else was there; no national religious, no Israeli tour group, no nothing. This was actually great for us. Our first destination were the Toldot Aharon. What can I say ? It was more than packed. As soon as we entered, we only saw women's legs in front of us. All the women had already occupied the metal benches and there was no way for us seeing anything. We ended up standing somewhere in the middle in front of a white metal gate. A metal gate between the metal benches. One of the Toldot Aharon women was in charge of the gate and she let in only other female group members. Suddenly she turned to me and said that she knows me by sight: "You have been here many times before, right ?" When I nodded she wanted to let me in. I told her that I am not alone but with two more friends. 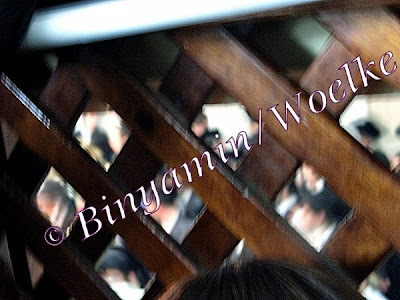 Actually I didn't need to stand right behind the Mechitzah, as I have seen it hundreds of times before. But maybe she could let in my friend who has never seen such a Tish before. In the end, all the three of us were allowed to enter in order to stand behind the Mechitzah. The woman explained me that they closed of the best seats due to the presents of the Rebbitzen's family. First we were told that we can only stay for two minutes but then the woman just let us stay. However, after approx. five minutes I felt bad, as more and more women showed up and I didn't want to take away their space. We left and went to the Toldot Avraham Yitzchak. I have no idea who this particular Toldot Aharon woman, who let us in, was. I thanked her but she didn't want to hear it. So, I am thanking her again this way. Thanks to her from my friends and me. As Rebbe David Kahn from Toldot Aharon had taken a short break, we went to his brother Rebbe Shmuel Yaakov Kahn and the Avraham Yitzchak. There is was the same. Packed. However, we found some space to stand right behind Rebbitzen Channah. She wore a beautiful costume and couldn't stop swinging to the music of the Avraham Yitzchak band. Great music I have to say. After half an hour or so, we left and walked through the Mea Shearim Market getting some fresh air. Our present heat wave in Israel makes chassidic Tishes sometimes very difficult. The Ezrot Nashim at Toldot Aharon and Avraham Yitzchak are always too hot and there is no air. At least, the Toldot Aharon have an air condition. 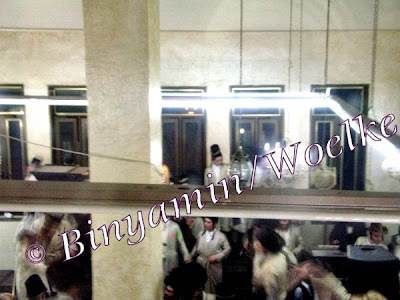 After a few minutes walk, we came to the Neturei Karta Synagogue "Torah veYirah". We heard great enthusiastic singing from inside and decided to have a look. However, the women's entrance only led us to a dining - room and my friends used the opportunity to look for the restroom. 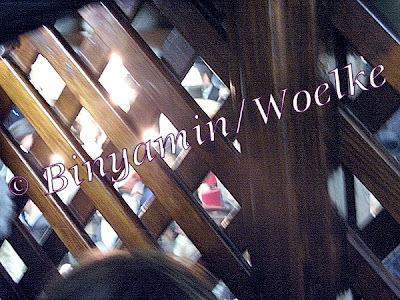 While I was waiting for them, a teenager boy showed up and I asked him for the women's entrance to the synagogue. He didn't speak to me but showed me the the door to the Ezrat Nashim. A few minutes later, we walked into a staircase but couldn't find the right door. In fact, our second friend got lost and in the meantime, some men showed up. But we made everything on time and didn't bother anyone. Unfortunately, we didn't see the synagogue but hopefully next time. 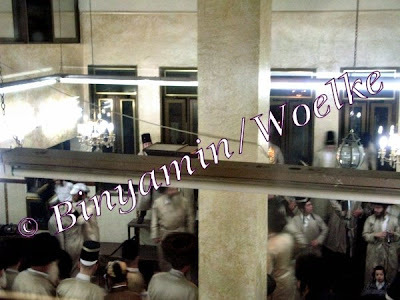 The "Shomrei Emunim" had moved to a bigger hall in order to celebrate and their synagogue was empty. We didn't feel like looking for the other hall and kept on walking. The next destination were the "Mishkenot HaRoim", the secret Mea Shearim group. We were so lucky; many women were walking in and so did we. The Mishkenot HaRoim Synagogue is not too big but has a great Ezrat Nashim. Glass windows and we were able to see everything. Chassidim were dancing enthusiastically and we really enjoyed the music. We enjoyed all the different bands and chassidic groups and I couldn't say which Tish or celebration was the best. They were all great. When we walked over to Chassidut Stropkov, only a few meters further, we saw a Chassid laying on the sidewalk. Obviously drunk but as our second friends is a doctor, she was worried. However, other Chassidim assured her that the drunk was fine but only drunk. The Stropkov Synagogue is small and the Ezrat Nashim looks rather like a little living room. Of course, it was full and my friend didn't succeed too much in taking a picture through the Mechitzah. I saw very little but again, music was great. The view through the Stropkov Mechitzah. Next destination: Karlin - Stolin. They had especially set up a tent. Everyone could have a look inside and my friend made some photos. 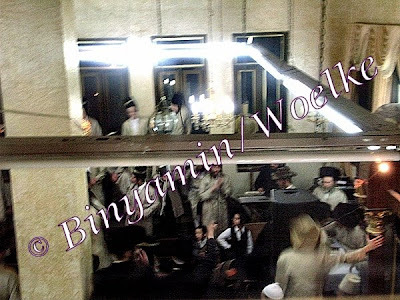 We wanted to go to Satmar (the Beit Midrash of Rebbe Zalman Leib Teitelbaum), Kretchnif and Dushinsky. Instead we decided to go to Sadigora, Kaliv and Chernobyl. Unfortunately, the last three three didn't have anything going on and we ended our trip. I was completely finished and couldn't move my knees anymore. It was a tremendous experience and I am still a little off from all of that. The Right Way Out ? No, I am not Chabad !!! So, how is Jerusalem ? What makes one a Zaddik (Righteous) ? Who says "Men don't like to Gossip" ?